Gerbing's award winning motorcycle ‘top of the range’ innovative and revolutionary European patent pending new Microwire® heated gloves. 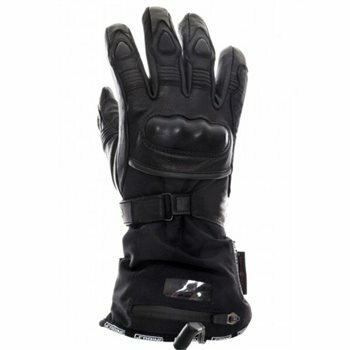 An extremely comfortable and safe glove made with an exceptionally soft and supple drum-dyed 0.6 mm premium full aniline leather that contours to the hand. Using a Hipora ® liner the XR-12 heated gloves are waterproof, windproof and breathable providing protection from the outside elements. The design is sleek, stylish, very functional and light whilst incorporating hard knuckle impact protection. Gerbing’s Hybrid XR12 gloves offer the best of both worlds. If you're cruising for hours, just connect these heated gloves directly to your vehicle battery using the supplied battery harness and junior controller. Alternatively, if you are just riding for an hour or so then plug in the optional small rechargeable 12v Lithium portable batteries. These batteries have three heat settings and will power the gloves for up to 3 hours. How Much Power Will Gerbin Heated Gloves Draw From My Battery ? As A Guide, A Standard Motorcycle Will Draw 55 Watts On Low Beam And 60 Watts On High Beam. These gloves are great even without being hooked up to power, very pleased with my purchase. Well made glove. Has good heat around whole hand.